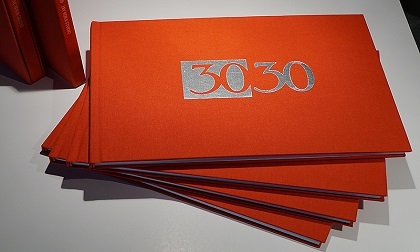 TORONTO, Sept. 15, 2016 – Automotive Fine Arts Society (AFAS) member Jay Koka has announced the publication of his latest book “30:30” commemorating 30 years of automotive fine art. Known for his ability to manipulate color and mood through impressionist inspired art, Koka’s book features more than 96 pages of full-color scenes, as well as a gallery of 30 selected images spanning his 30-year career. The book is available for purchase online or at select shows and events. A sneak preview of the “Next Decade” including some of Koka’s latest works recently displayed at Pebble Beach Concours d’Elegance in August 2016. For fine art collectors looking for a more unique and personalized touch, a handful of limited first-edition copies of Koka’s book are available for $200. Each copy is signed and numbered and features a handmade hard slipcover. Personalization of the book is also available upon request for the limited-edition version. Koka lives with his wife Cathy near Toronto. For more information about Koka’s 30th Anniversary Book or an in-depth look at his work, please visit www.jaykokastudio.com.